Resolved that a subscription be entered into and forwarded to raise the money to defray the necessary expenses of the said Altar-Piece”. Benjamin West, American born, was a court painter to George the Third and of considerable reputation. 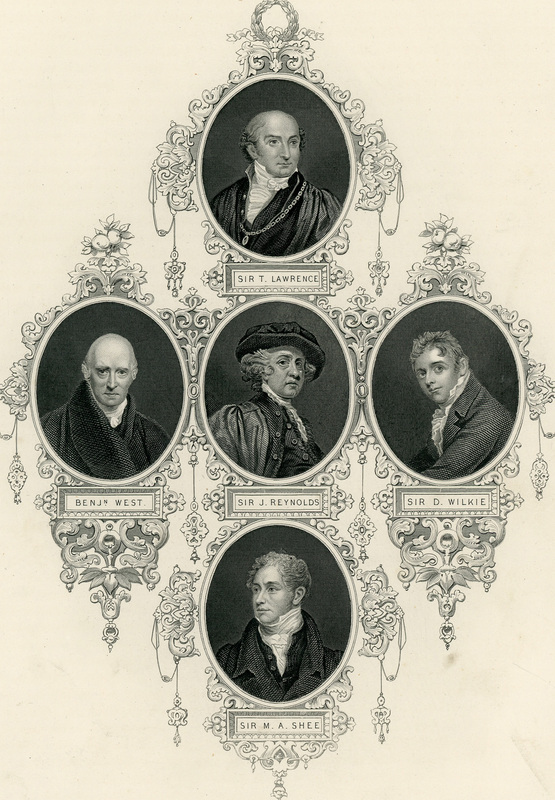 He later succeeded Sir Joshua Reynolds as President of the Royal Academy, some Presidents are shown in Fig1. The “design” would be a painting by West and was to be hired by Eginton, reputedly for a fee of eighty guineas. For the window to be part of an Altar Piece suggests some structure around it and it was appropriate for it to be “inspected” by Mr S Wyatt who was the leading architect of the Town at this time and who had also been consulted on the design of St Paul’s Chapel. Furthermore the window was not to be what is normally regarded as stained glass. There was a big move in the 18th century away from the use of clear and coloured glass which had been stained by the glass painters. They brushed compounds on to the surface and then fired the glass in a kiln so that the compounds diffused into the glass and “stained “it with various colours. Now the painters were using rectangular panes of clear glass, no coloured glass at all, and painting with compounds which turned into enamels on firing and with enough diffusion into the glass to bind the enamel to the glass. From this they would try to recreate an oil painting on canvas into an enamel painting on glass. However the enamel does not transmit light like coloured glass. It is more translucent than transparent. Eginton had become a master of this technique and such windows became known as painted windows. Perhaps it would have been better to call them enamelled windows. They are very different from conventional stained glass windows. Fig 2 is a photograph of the Eginton East Window. There are three separate windows. On the left, Saul, whose head is near the top, under the Roman flag and with a beard, is persecuting the Christians. In the centre, blinded by light on the road to Damascus, he has fallen off his horse, and in the window on the right his sight is being restored by Ananias. What you can see when you visit the church can vary quite a lot. The surface of the enamel is matt and it scatters light originating in the church. When the sanctuary lights are on very little light can be seen coming through the enamel and it is not a great deal better with only nave lights on. It is certainly worthwhile requesting nave lights to be turned off. At certain times the sun’s rays shine through the elevated windows on the south side of the church and spoil viewing. Again if you have just come in from the sunshine outside, take time for your eyes to adapt. Just stand in front of the window and see how it changes as your eyes dark adapt. A good time to view can be in the afternoon when the sun’s rays are reflected back from the buildings in the Square behind the window. At the time of the year when the rising sun shines through the window, the church will probably not be open! Lots of white light, such as with snow on the ground, can be a good time too. 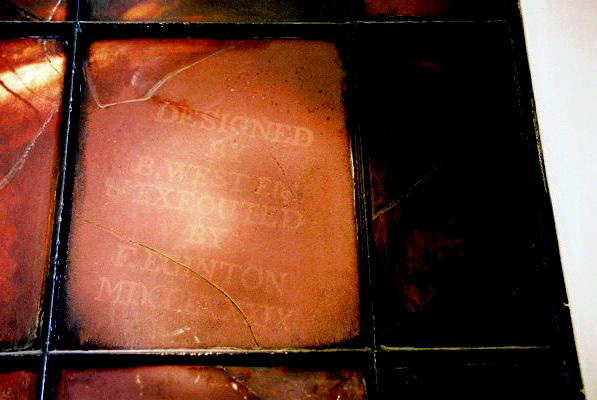 To the right of the centre window there is a pane with words impressed in the enamel stating “ DESIGNED BY B WEST ESQ & EXECUTED BY F EGINTON MDCCLXXXIX” i.e.1789, shown here in Fig 3. 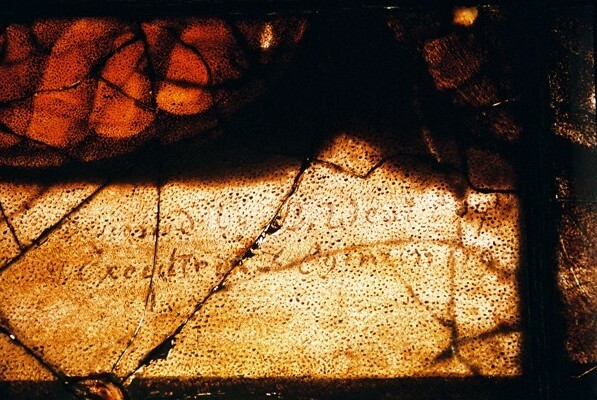 Near the bottom of the right hand panel can be seen, “Designed by B West Executed by F Eginton 179?” in Eginton’s handwriting, shown here at Fig 4. But how did the window compare with West’s painting? Before about 1950 nobody knew because nobody had seen a West painting of the Conversion. Then Smith College Museum of Art in the USA revealed that a painting by Benjamin West on the Conversion of St Paul had been donated to them and it appeared to be the original painting. There were three panels, each on the same topic as the windows, and the centre panel had been signed and dated 1786 by West. 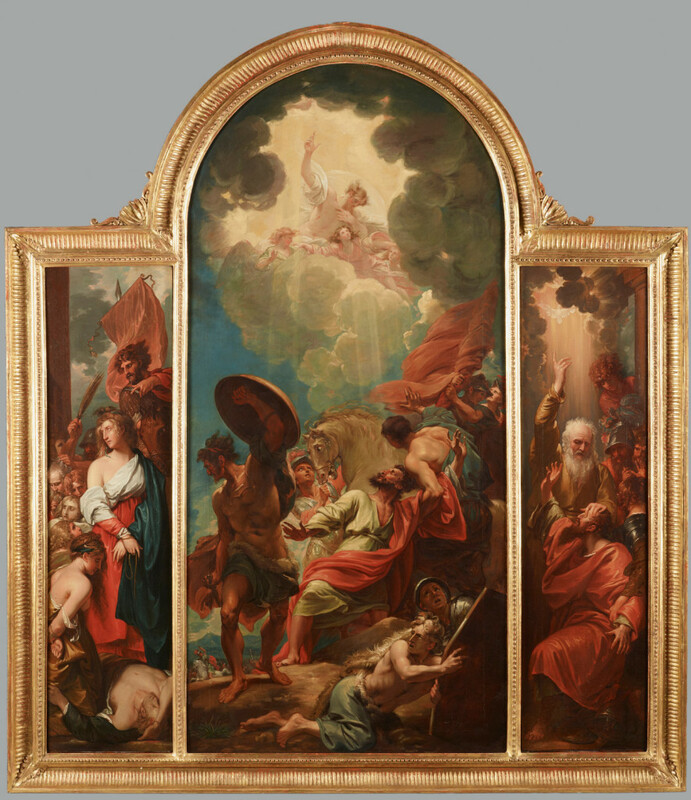 There were additionally two other small panels in the complete frame but they were thought not to be by West and not connected with the Conversion. What was very different was that Christ in the painting, at the top of the centre panel was upright with left arm raised and right arm extended, very different from that in the window. The assumption was made that Eginton had put his own interpretation on the figure and changed it, in the words of the incumbent at that time, into “a rather forbidding Old Testament “God the father” figure possibly in response to the very Unitarian theological atmosphere of 18th century Birmingham”. That, on reflection, was a huge change to West’s design. None the less, with a date of 1786 the Smith College painting was assumed to be the original that Eginton worked from. Their opinion might have been reconsidered if they had been aware of an article by W C Aitken in the Transactions of the Archeological Section of the Birmingham and Midland Institute on Francis Eginton and dated 1872. In it Aitken reproduced a letter from West to Eginton dated December 8th 1789 which opens with “With this letter you will have the happiness to receive Ananias” and when Eginton had finished with it “…conduct him safe back to the house of Benjn West in Newman Street London”. Just a few years ago everything changed, for us, when Jacqui Townsend, the Secretary of St Paul’s Church, found on the website of Dallas Museum of Art a painting by Benjamin West of the Conversion of St Paul that had been donated to them and the painting was shown on their site. This version, of size 58”x 49”, had Christ in the same posture as in the church window, but was not dated. It transpired later that Smith College had conceded that their version was probably a preliminary design and not likely to be the one Eginton used and that the Dallas version was likely to be. Dallas Museum of Art provides downloads available for non- commercial and research use, and as this website is not commercial and researches history, a download of the painting is shown here in Fig 5. Now, further than that, on the website of Bridgeman Images there are two paintings of the Conversion by West listed. One is the Dallas painting and the other is from a private collection. From a necessarily very limited examination of the small images they appear to be identical. Even the frames look identical, but there is one major difference. In the private painting the side panels are transposed, with Ananias on the left and the Persecution of the Christians on the right. 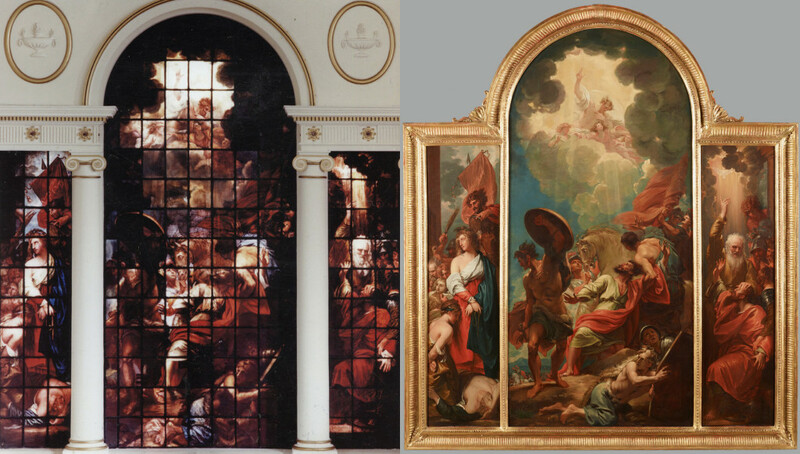 Going further, there is at present a website showing three separate, but narrow, images of the three panels by West under “A design for a window etc” seemingly identical to the private version with the panels transposed, but with no owner attribution. Figs 2 and 5 are brought together in Fig 6 to help compare enamelling on glass with the painting on canvas. The clouds at the top of the middle window are very dark compared with the painting, in fact a number of areas are very much darker than the painting. Aitken writes that West instructed Eginton to paint the window “very dark and strong in colour”, an instruction he seems to have followed. Comparing in detail, the left hand window is a very good representation of the painting. For the right hand window the figure with the mop of hair, top right, is totally lost in the window. In the centre panel the flag and figure on the right are of little significance in the window and much of the left and some of the middle are lost to blackness in the window. The success of the reproduction in the left hand window suggests that Eginton had the process well under control, yet the reproduction does not look quite so good elsewhere. During the last war a land mine was said to have exploded to the north of the church destroying the glass in the windows along that side. This could well have caused damage to the Eginton window. Then in 1965 came a calamity. At that time there existed a Church Hall, built of wood, very close to the church at the east end and in particular very close to the right and middle windows of the Eginton window. This can just be seen in the photograph of the Hall in Fig 7. 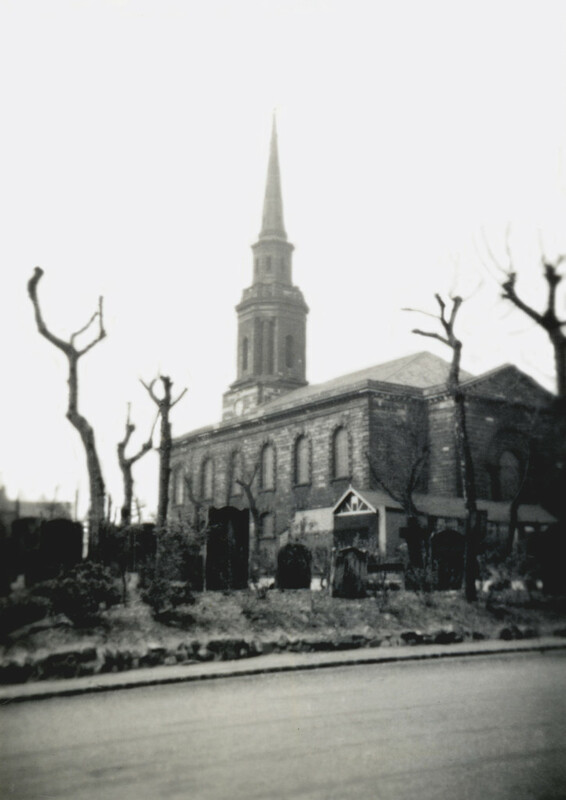 In October 1965 the Hall was destroyed by fire. John Hardman Studios were called in to examine the window and recommend what action had to be taken. In February 1966 they reported that the window “…is painted and fired in enamels on two layers of very thin glass” and that “..sheet protection had been added against either the inside or outside (or both) of many of the panes”. Fig 8, shows just how engulfed the Ananias window must have been, and how dirty the stonework was. 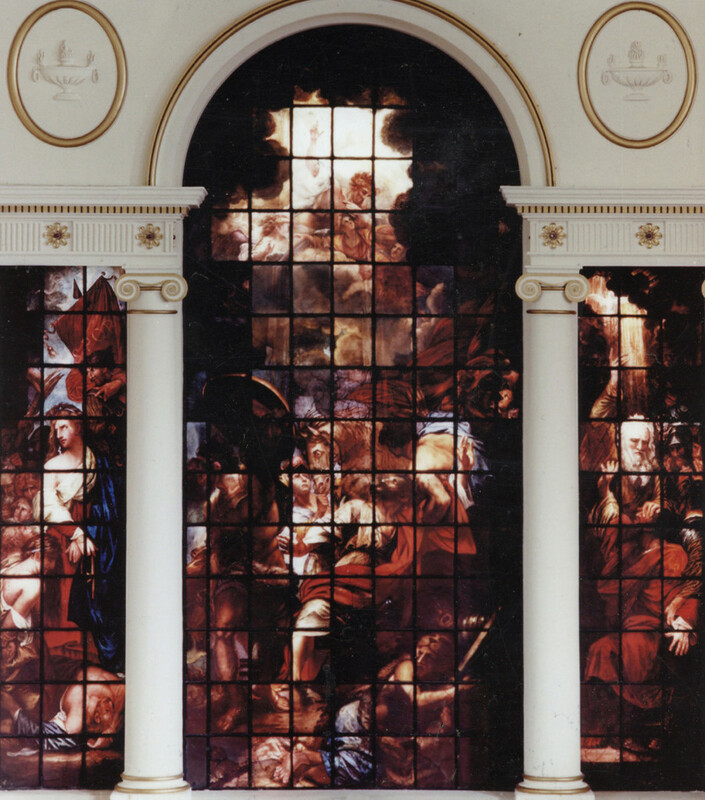 In a restoration programme in the 1990s, when the church stonework was cleaned, the window was examined by Chapel Studio. In 1993 they reported that the two sheets were enamelled on all four surfaces and that this gave “tremendous depth to the design, yet results in some very dark areas….the enamel is applied in a very interesting way, the half tones being made up of dots of varied colour which fuse together as the window is viewed”. They estimated that 65% of the window had been damaged and suggested it was bomb damage. They realised that there had been a large scale restoration of the window and recommended that large scale interference again was inadvisable. There were at least six panes in a very serious condition and were to be dealt with but most of the window was sound despite the damage and any large scale works would be very complex and expensive so best to leave alone. And so it remains. One aspect of the restorations is that there is no reference at all to a comparison of the window with the Smith College Museum of Art painting. Of course it was the job of the restorers to look at the glass itself but it is surprising that no-one seems to have procured even black and white photographs of the painting. It would surely have helped the restorers if only to locate the areas that looked as though they may have been damaged. Going back to the beginning, on January 10th 1791 there was an announcement that the window had been completed and was being prepared for installation at the beginning of April. It also stated that the cost was 400 guineas and that a subscription had been launched four years earlier but only 250 guineas was subscribed. On March 28th a further announcement stated that the window would be opened in Easter Week and would be accompanied by select pieces of sacred music and that there would be “..two Grand Miscellaneous Concerts at the Theatre” and “..an organ, made by one of the most eminent builders, for the use of St Paul’s Chapel, will likewise be opened on the above Festival.” This was all intended to raise money to pay for the window, but alas, the efforts were said to be “unproductive”. On May 2nd Eginton thanked “… those Gentlemen who so generously patronised the Altar-Piece” and added that he “has only to hope that the Public in general will candidly allow the Difficulties attendant on the Execution Of his Work to apologize for its Imperfections”. Also in May came “at this time more than 200 guineas wanting to complete the Committee’s Engagement with the Artist and to defray the other unavoidable Expences”. Not much had changed. 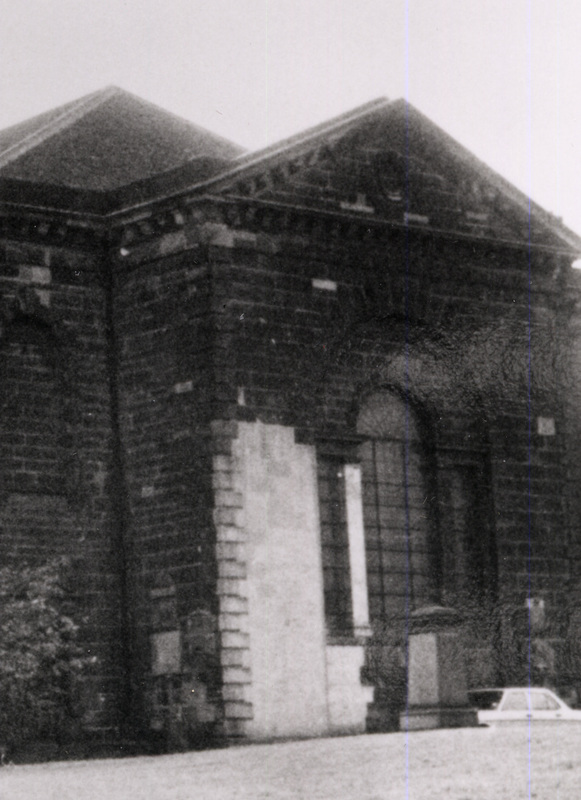 There had been great difficulty in raising funds for building the chapel. Now, 12 years on, there was difficulty raising funds for Eginton’s window. No further announcement has been found, but there have been comments that Eginton lost money. The committee would have been expected to fulfil its obligation to Eginton and settle with him. It is reasonable to assume that the skills evident in the left window were also shown in the centre and right windows and that Eginton made a fine, though darker, reproduction of the oil painting on canvas with enamel on glass. It was certainly acclaimed and attracted many visitors. It follows that the present state of the windows may be due to grime, bomb damage and the fire. There is still much to admire. The Director of the Smith College Museum wrote in 1951 “ It is hard for 20th Century taste to find any mastery in 18th century enamelled glass” It may be hard, but surely there is an Eginton masterpiece here. We now know the sequence of events for the window to be the commissioning by the Chapel in 1785, the opening of the subscription list 1787, the completion of the centre panel 1789, the delivery to Eginton of the Ananias panel December 1789, the official opening Easter 1791. We remain unsure which particular painting Eginton used, will we ever know? Perhaps one day the private owners will bring their painting to St Paul’s and display it in front of the window and we can all wonder at what Eginton created in enamel on glass from an oil painting on canvas. Are any painted/enameled windows made nowadays,or is the fashion still for stained glass? I don’t know but suspect very few enamelled windows. Part of the mid-19th century Gothic revival was to revive coloured glass so stained glass came back into fashion with a vengance. Many enamelled windows were replaced, and destroyed, so there are not all that many enamelled in existence. Eginton’s has to be one of the best.